Clover: it's what's for dinner. And breakfast. And lunch. Like many great things in life, it started with the City of Wichita Parks & Recreation website. I was browsing through the catalog of classes, when suddenly "Become a Beekeeper" caught my eye. Beekeeping had always seemed like a mysterious art, full of arcane tools and knowledge, but here was the opportunity to gain initiation into the obscure club with just a 10-week class. I signed up immediately. I wasn't sure if I actually wanted to get bees right away, or even if I ever did, but I've always found them to be fascinating creatures, and I knew that learning about them from an expert was an opportunity I couldn't pass up. I figured I could go through the class and decide later if I was up for the challenge of hosting a hive in my backyard. But only two weeks in, our teacher told us that he would soon be traveling to Utah to bring back what's known as "packages" of bees - a mesh cage containing three pounds of worker bees (yes, they're measured in pounds) along with a queen, all the necessary critters to get your hive started. He only makes the trip once a year, since spring is the optimal time to start a new hive, and there would be a limited number of packages available. I was a bit apprehensive about jumping into beekeeping with so little knowledge under my belt, but at the same time, I hated the thought of waiting an entire year before I could really get started. After sleeping on it for a few days, I decided it was time to live up to the name of the class: I would Become a Beekeeper. Can you really keep bees in the city? 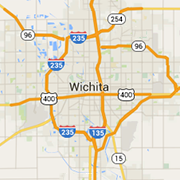 The City of Wichita allows you to keep bees, and does not require you to register your hives. However, surrounding towns and homeowners associations within Wichita itself may have their own regulations, so make sure to double check before you get started. Don't let the fact that you're not out in the country discourage you - although you might think that a rural location would be best for a hive, urban bees actually tend to do better: they have a higher winter survival rate and produce more honey, due to the fact that they have a greater variety of plants to feed on, and less exposure to pesticides. Since city-dwellers are closer together, it's generally considered polite to talk to your neighbors before you start beekeeping... and to treat them to honey once you're able. This is definitely the most common question I get when I tell people that I have bees. Although I have gotten stung a few times, most of the time my bees barely acknowledge me. They're happy to have me hang out near the hive to observe them, and they'll even crawl around on my hands for a while before flying away. Stings are annoying, but unless you're very allergic, it's usually not a major issue for the backyard beekeeper with just a hive or two. There are, of course, some ways to reduce your chances of being stung. First and foremost, always wear your protective gear when you're opening the hive to check on your bees! After all, wouldn't you get a bit upset if someone took the roof off your home and started rearranging the furniture? Covering yourself with thick, loose-fitting fabric will help prevent any attempted stings from actually reaching your skin. Secondly, the genetics of your bees plays a big role in how likely you are to get stung. Just like dogs and cats, there are different varieties of honeybees. Most backyard beekeepers in the US will have Italian or Carniolan bees, both of which have been selected for a gentle temperament. Despite this, sometimes a hive does end up being aggressive, attacking anyone who dares to come near. The genetics of your particular hive is entirely determined by the queen, so replacing the queen with a new one is often the best solution. However, it should be noted that aggressive hives tend to make more honey, so some people simply choose to relocate these hives to an isolated area, and to reap the rewards come honey harvest time - while FULLY suited up, of course! For the typical backyard beekeeper, you won't need to spend too much time on your bees - though if you're like me, you'll find yourself out at the hive constantly just to watch them! The biggest time requirement is conducting hive inspections, which should be done once every two weeks. During the inspection, you'll go through the entire hive, pulling out the frames one-by-one and checking to see how much brood (baby bees, essentially), honey, and pollen are present in the hive. You'll also want to look for evidence of pests, such as beetles and mites, as well as other potential health issues. Regular inspections are essential so that you can catch any problems before they get too bad, and so you can see when your hive is doing well and needs to have additional space to grow. The inspection process can be a bit awkward and intimidating at first - you're wearing bulky protective gear, getting accustomed to unfamiliar tools, surrounded by a cloud of buzzing bees that you don't quite trust yet - so your first few inspections may end up taking a while. As you get used to the process, you'll get faster and faster, and eventually your inspection will take 30 minutes to an hour to complete. What's required to get started? Langstroth hive with feeder. Flower stencils optional. Bees: of course! Although bees are often purchased from local suppliers, you can also order them online (during the right time of year, of course!) from a vendor like Kelley Beekeeping. If you're already friends with a beekeeper, you may also be able to get bees from them if they're looking to split their hive in the spring. Hive: although there are several different kinds of hives available, for your first one I'd recommend a Langstroth style, consisting of rectangular boxes of various depths which have frames inside for your bees to build on. This is the most common type of hive for backyard beekeepers in the US, so you'll be able to get lots of information and advice from fellow hobbyists. You'll want to make sure your hive kit includes two deep boxes (sometimes called a "brood chamber") and two medium boxes ("honey chamber") - there are some hive kits out there that only include a single deep box. While this is enough for your bees at first, they'll soon grow too numerous for a single box, and if you're not prepared to give them additional space, they may swarm and fly away. Protective Clothing: time to rock that iconic beekeeping fashion! Although some brave beekeepers work with only a veil to cover the face and head, most opt to also wear a jacket or full suit. You'll also want to get gloves made from thick canvas or leather to protect your hands. Hive Tool: although it looks unassuming, like a mini-crowbar, this tool is absolutely essential. Honeybees put propolis (possibly the stickiest substance in the universe) into every nook and cranny of the hive to keep it sealed up. You'll need to use the hive tool to break those seals when it's time to do your biweekly hive inspections. It's also used to scrape off any excess comb that the bees have built outside of the proper spaces in their frames, which you'll want to do regularly, since misplaced comb can interfere with ventilation. Frame Grip: although not strictly necessary, this tool makes it much easier to pull frames out of the hive when doing inspections. Once you've spent time outside in 90 degree weather wearing a protective jacket, you'll know the value of a speedy inspection. Smoker and Fuel: even before humans domesticated bees, they were using smoke on wild bees in order to harvest honey. Smoking your bees can help calm an agitated hive, making it easier to do your inspections and reducing the chances of getting stung in the process. However, a smoker is a useful tool even for the most docile bees - it drives the bees down into the hive, meaning you'll crush fewer bees as you move boxes and frames around. Feeder: to give your hive the best chance of thriving, you'll want to feed them sugar syrup until they've filled the first two deep boxes. Having this easily-available source of food allows them to devote more energy to building up the hive. Even after the hive is established, you may need to occasionally feed your bees - when it gets extremely hot for prolonged periods of time, trees and plants will stop producing nectar, leaving your bees without much to harvest. Feeding your bees during these times means they won't have to dip into the honey stores that they need to save for winter. As you progress with your hive, you may want to experiment with other tools and supplies, but this should be enough to get you off to a very good start. Online shops like Kelley Beekeeping and Mann Lake are a great place to get everything you need. For a local source, Hillside Feed & Seed (1805 S Hillside) carries many of the essentials - and is a fun place to browse around as well! Yes, I'll eventually get harvest my own honey. Yes, they're great for pollinating neighborhood plants. Yes, I'm concerned about colony collapse disorder. But ultimately, I got my bees simply because I think they're really cool. Honeybees are electrostatic animals who communicate with dance and pheromones, fly up to seven miles from home without getting lost, produce a food that never spoils, and understand the concept of zero - they're amazing! It's hard to imagine welcoming up to 60,000 stinging insects into my backyard, sweating in my veiled jacket, hefting the heavy boxes of the hive, without having at least some underlying passion for bees. You might not share this passion... you might even think I'm a little bit crazy for keeping bees. Many people do! But just as many are intrigued, especially after they come and see my hive for themselves. If you're even a bit curious, make sure to keep an eye on the Parks & Rec catalog for the next opportunity to get into a class. You just might be inspired to Become a Beekeeper too!